With El Niño conditions increasing the likelihood of extreme weather in California throughout the rest of the year, including potentially dangerous flooding, a team of scientists from UC Santa Cruz and the Nature Conservancy has published a study that provides a method for the state to reduce the risk of flooding, save coastal buildings and structures, and preserve habitat. The report, published July 22 in PLOS ONE, targets the statewide issue of risky coastal developments that are currently in danger of flooding and that also impair floodplains' natural abilities to protect coastal communities from flooding. The report's authors have developed an easy-to-use method that identifies the areas where the greatest risk reduction and habitat conservation benefits can be achieved simultaneously through FEMA hazard mitigation projects in California. "We developed a multi-objective approach to identify areas where the greatest risk reduction and habitat conservation benefits can be achieved simultaneously in California, effectively killing two birds with one stone," said lead author Juliano Calil, a Ph.D. candidate in the Ocean Sciences Department at UC Santa Cruz. "We are facing very complex environmental and socioeconomic problems around the world at an unprecedented scale. Approaches like the one we've developed, where distinct goals are combined into multi-objective projects, are going to be essential to solve these issues. It just doesn't make sense to talk about reducing future flood risks and damages without considering restoring floodplains." The National Flood Insurance Program (NFIP), under FEMA, has paid out more than $38 billion in claims since its inception in 1968. More than $12 billion were paid to the one percent of policies that experienced multiple losses and are classified as "repetitive loss properties" or RLPs. Since 2012, more than $150 million in flood insurance claims were paid by FEMA to more than 3,200 California property owners. California lost 91 percent of its coastal wetlands, more than 4.5 million acres, from 1780 to 1980, making it the state with the highest losses of wetlands in the country. 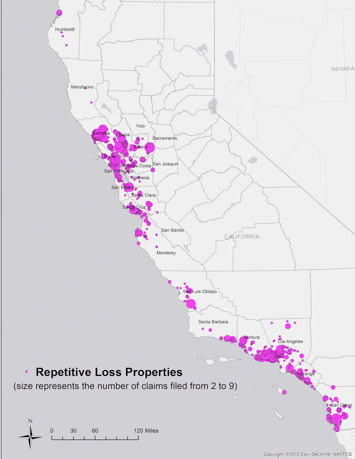 Sonoma County, a hotspot of repetitive loss in California, occupies roughly 1 percent of the total area of California, but accounts for 32 percent of all NFIP claims in the state. "Unless we reduce risk globally, annual flood losses may top $1 trillion by the year 2050," said coauthor Sarah Newkirk, coastal director of the California Chapter of the Nature Conservancy. "Risk reduction by fortifying unwise development will cause further loss of wetlands, but conservation and restoration of floodplains that act as buffers to coastal structures will help fisheries, beaches, and coastal communities." The benefits from the approach presented in the study are threefold: (a) structures removed from floodplains take people and property out of harm's way; (b) restored floodplains protect communities and provide invaluable ecosystem services; and (c) FEMA reduces its exposure by tackling the most risky structures and enhancing nature's ability to buffer floods. 32 structures in the State of California filed 9 or more claims against the NFIP since its inception. 11,243 square kilometers in coastal California represent both flood exposure reduction and conservation value where property/structure buyouts and habitat restoration projects could be implemented simultaneously. Nearly all of the RLPs in Sonoma County (95.3 percent, or 813 properties) are located in areas where Flood Exposure and Conservation interests overlap.